WOODEN PALLETS FOR ALL PURPOSES SINCE 1965! Pentti Virtanen, born in 1928 in Mannila, Honkilahti, started his working career by fishing at the nearby lake Pyhäjärvi. The young man was on his own, as in the war-ruined Finland the family was not able to financially support him. The poverty of Pentti’s youth was symbolized by the fact that, according to his own words, he never received anything but a pocket watch from his father. Pentti’s father Frans was a shopkeeper in the Mannila village. The livelihood was not spectacular by any means, but the family was better off than many of the contemporaries. Pentti started buying fish from the other local fishermen and begun selling it to fish wholesalers all over Finland. A car was required to trade fish, but buying one was not easy during depression period and a lack of cars. Money had been gathered just enough to cover the expenses of a small used Commer truck. 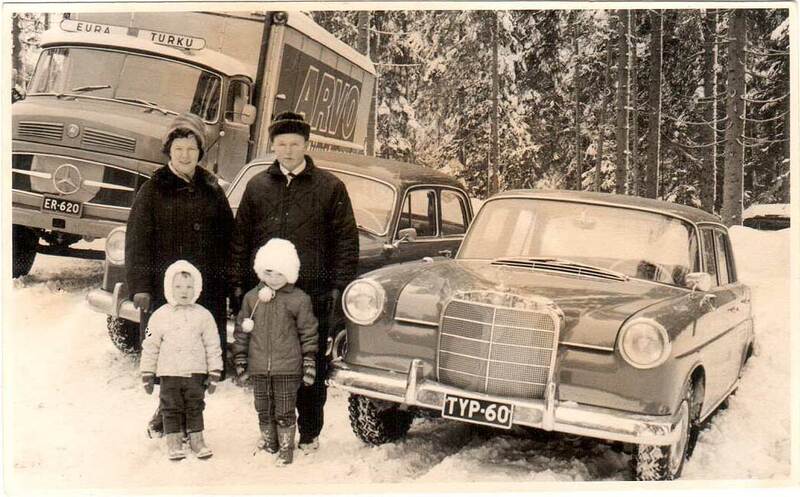 Trading fish started to pay off a little by little, and life seemed great when Pentti could afford to buy a brand new Commer. Fish was transported both in the summers and winters with the pickup truck to train station in Kauttua, sometimes to Turku and many other places. The cold chain was maintained by placing cubes of ice to the fish boxes, but it is very likely that the ice was not enough to keep the fish cold during long train trips throughout Finland! Pictured new truck, still without a bed, probably just picked from the salesman. Exact year not known. When trading fish, Pentti brought home anything the locals needed from the town. Fish trading was forgotten as the transport business grew. Commer was substituted by a diesel-run Mercedes-Benz, and the time of the transport business begun. The company started off with one vehicle, slowly increasing the number of trucks. The vehicles did good transport both on charter and line basis. The line shipping route was Säkylä – Kauttua – Honkilahti – Turku. The transport business guaranteed the livelihood for the family but was no gold mine. The number of vehicles was reduced down to two in the 60’s. The businessman had familiarized himself with the local industry in Kauttua and Säkylä, and this partnership led to a new business venture. Family Virtanen in 1965. Parents Raili and Pentti, children Markus and Elina in the front. In 1965 Pentti started to produce packaging materials for Ahlström’s Kauttua factories. Ahlström was trading with the Soviets, and paper for caramels seemed to be in endless demand with the Eastern neighbor. The rolls of caramel paper were protected with wooden hardboard panels, and the roll cases had to be supported with turned support sticks. Hardboard panels and turned wood sticks might have been the first products, but the first pallets were manufactured already in the late 1960’s. First pallets were assembled by hand using hammers, as pressure nail guns were adopted only in the 1970’s. The caramel paper packaging methods changed and hardboard panels and turned sticks were abandoned by the end of the 1970’s. The pallet production grew in both volume and significance. Ahlström Kauttua needed warehousing for the products from its factories. To complement the packaging production Pentti built warehouses to Honkilahti and started offering warehousing services. 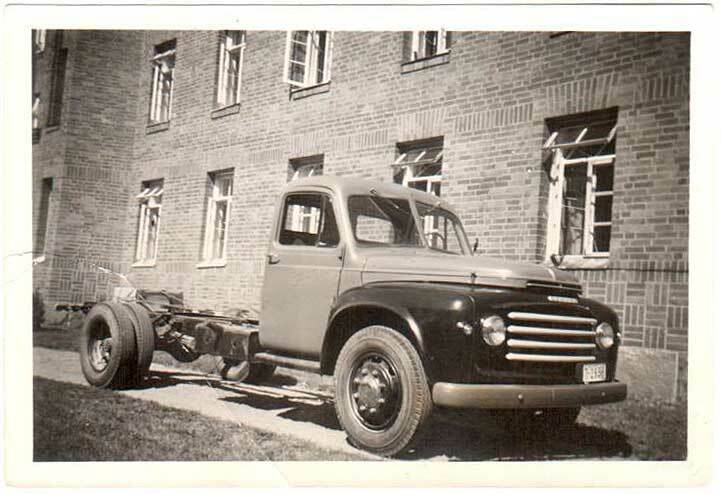 Ahlström products were transported between Kauttua and Honkilahti daily with Pentti’s truck. Warehousing services were later offered to also other customers. 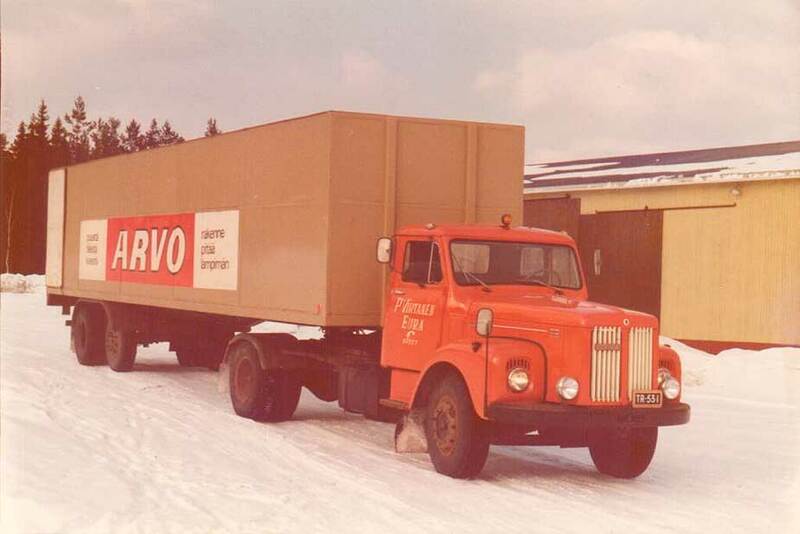 This truck was used to transport products from both Puutyöliike and the leased warehouses. Picture from the 1970’s. Puutyöliike production facilities were destroyed by fire in 1976. The end of something old, however, has always been the beginning of something new in both Pentti’s and the company’s life. The fire hit the company hard financially, but it kickstarted the mechanization of the production. The era of the pallet machinery began. In 1995 fire visited the company again, and production was destroyed. The fire turned out to be arson, but unfortunately the criminal was never identified or caught. The same night there was an attempt to arson a church in the neighboring municipality, but fortunately the church did not burn. Puutyöliike did not give up, although finances were stretched again. The production was rebuilt to be even more modern with completely new machinery. Special arrangements were made to ensure the continuity of customer relationships. The staff performed at its best, and not a single customer was lost. In 2013 the new generation stepped up as Pentti retired at the age of 85. The children Markus and Elina had, at that point, worked for the company for years, Elina 16 and Markus 29 years. As Pentti retired, the company became solely owned and managed by the two siblings. In 2017 Markus’s son Ossi started as a new shareholder in the company. Ossi has worked for the company since 2011, with only the exception of one year spent in the Finnish Defense Forces. In the history of the company one thing has always led to the beginning of another. What used to be fish trading business is now a modern pallet factory. Puutyöliike P. Virtanen is nowadays a strong competitor in the Finnish market for pallets. Changes and developments of the world require us to continue moving forward in the future as well. We solemnly intend on being the best player in the market also in the future.